I bought this area wool rug for my Master Bath, it is beautiful! The quality is outstanding,I would highly recommend.It is a high quality wool rug and sheds very little. Also I liked that it was reasonably priced!! Dimensions 2 ft. 3 in. x 8 ft. 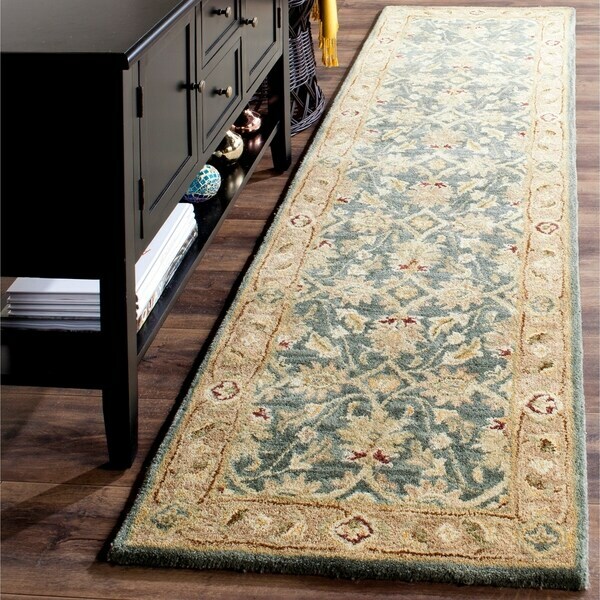 Very nice rug runner for my long hallway. 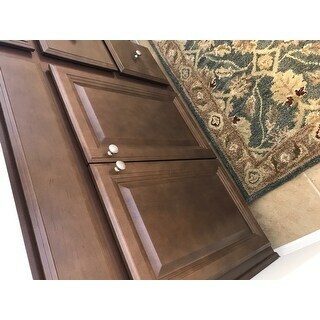 Looks very nice and stays in place with liner underneath on my hardwood floors.the rug is wool but I haven't noticed much shedding or lint balls. Easy to clean with vacuum. The rug is true to color pictured online. Great value! I wrote a review on the 3x5 rug in the same design that was meant for this rug, the 2x8. If possible can you transfer that review to this rug. Sorry. If not please read my review on the 3x5 rug. Purchased the matching round rug to this runner, definitely worth the money Thick material, so I did not need the rug pad.liked it so much I bought another one. This runner is a slight bit lighter then the matching round rug. Safavieh makes great quality rugs for an affordable price! This rug is well made and true to color on screen Safavieh. Very happy with this purchase. Delivered very quickly and looks just like the picture with several shades of beige and tans and a lovely shade of soft teal, more on the blue side than green. This carpet is thick and well made. I have purchased Safavieh carpets befor and have always been satisfied. very happy with this runner. Thick and soft. Muted colors. This runner looks great at our front door and in the foyer. It matches our dining room rug which is in the adjacent room. It is thick and plush. Has some shedding but love it. Throw rug is exactly what we were looking for our entrance . Just perfect. Very nice and great quality. Needs vacuumed a lot to reduce the initial shedding. I love everything about this rug! It is very high quality, thick and soft. The edges are nicely finished and it looks much more expensive than it was. The colors are softly muted and accurately portrayed in the pics. Highly recommended. I love the quality and the price. It is keep shading. It is the worst product I ever bought. colors are what i need for hallway and wanted a durable wool rug. also, your price was best!! !